Gig Harbor is a beautiful town on the shore of Puget Sound in Pierce County, Washington. With a population of less than 10,000, Gig Harbor has a charming small town feel that is impossible to replicate. Gig Harbor, along with several other towns and cities, touts itself as “the gateway to the Olympic Peninsula.” Gig Harbor has become known as a popular tourist destination, thanks to its stellar location close to parks, and a historic waterfront that boasts plenty of things to see and do, including fine dining and local boutique shopping. Gig Harbor is located close to Tacoma and Seattle, so residents enjoy easy access to all that the big cities have to offer. In fact, in non-peak traffic times, residents can get to Tacoma in only 5 minutes, and to Seattle in a little less than an hour. The history of Gig Harbor dates back to a heavy storm in 1840, when, by chance, Captain Charles Wilkes brought a small boat, The Captain’s gig, into a harbor for safe haven. The following year, when Wilkes published the Map of the Oregon Territory, he had named the bay where he took shelter Gig Harbor. In the 1860s, a fisherman, Samuel Jerisich, made his way to Gig Harbor, along with many other immigrants from various countries, including Sweden, Croatia, and Norway. In the late 1880s, the town was platted by Alfred M. Burnham and was officially incorporated in 1946. 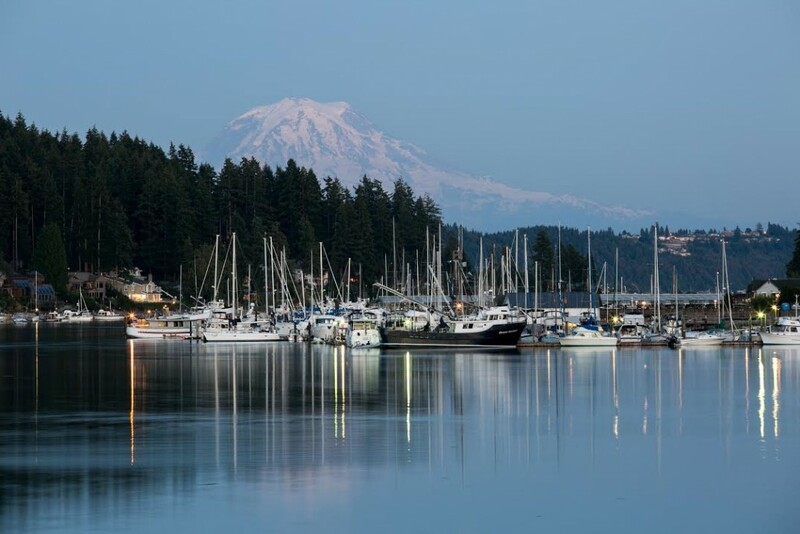 Residents of Gig Harbor enjoy an excellent quality of life. Unemployment in the city is low, the local economy is strong, and the housing market is stable. In a recent study based on per capita income, Gig Harbor ranked in the top 50 areas of the 522 areas in the state of Washington, that were ranked. There are several things in the area that you simply won’t want to miss. Cushman Trail and Harbor History Museum are two of the most popular things to do in Gig Harbor, and both are a great nod to the city’s natural beauty and history. Take in some sightseeing on a boat tour, and round out the day with a trip to one of our local breweries, such as 7 Seas Brewing or Heritage Distilling Company. You can find some of the best restaurants in the county in Gig Harbor. There are many restaurants such as The Harvester, the Green Turtle, and Tide’s Tavern, which are local favorites. You can find a place to have a quiet breakfast on the water, grab a quick lunch at a café, or enjoy a great night out on the town. Venture to Up Town Gig Harbor, where you will find an endless supply of large shops and entertainment. Marshalls, Kohls, and Home Goods are all located in this shopping center, as well as the Galaxy Luxury Theatre. There is nothing this shopping center doesn’t have. Gig Harbor is the perfect place to have a small-town feel, with the convenience of city living. Real estate in Gig Harbor is a popular search, and the demand for housing here can sometimes outweigh the supply. For this reason, it is especially important that you work with an experienced real estate team, who can help you navigate the waters and make sound decisions with your investment. My goal for our team is to serve our clients to the best of our ability, with the hearts of a teacher. We will get to know you and your family, and help guide you along each step of your transaction. To get started, call or connect with us online today.